Santa Pod Raceway, home of European Drag Racing, is delighted to announce its continued association with leading car care brand, Autoglym. Not only will this British car care specialist retain its lane sponsorship throughout this season, but is set to remain at the venue until 2014. Autoglym - which holds two Royal Warrants of Appointment - has been a part of Santa Pod culture for over six years now, being a lane sponsor of the venue's hallowed quarter mile. Its comprehensive range of products is also a firm favourite amongst the hundreds of thousands of visitors and Concours d'Elegance entrants at Santa Pod's shows and events each year. The new deal sees the two names inextricably linked for the next four years, cementing one of the most enduring partnerships in the sport's history. Santa Pod's 2011 season started with DWYB track days from the 8th of January and the event calendar begins with Stunt Fest on the 19th February. 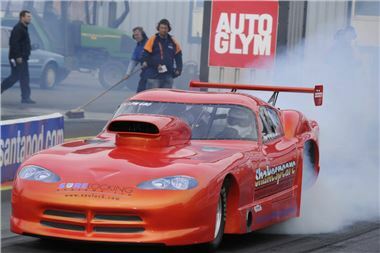 For more details on Santa Pod events, please click to www.santapod.com or call the team on 01234 782828.